I am not a morning person! And the canoe ride started at 7.30 am. That meant I had to get up at 6.45 at least. I don’t take much time to get ready anyway. When I turned up at the reception of the Kumarakom Lake Resort, they took pity on me and told me to go and have a cup of tea/coffee. I am a tea person but the coffee at the resort was divine, so for a very short while I switched loyalties. I left like a different person with a cup of coffee inside me. I concluded after the trip that a canoe ride in the Vembanad Lake is thing of beauty for observing the life in the backwaters up close. 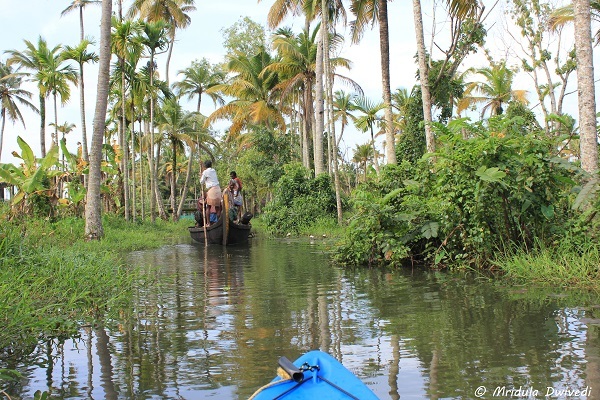 True to the theme of the trip to Kumarakom, I had the whole canoe to myself. As we got out into the waterway I sat on the first chair. The canoe was covered and the chairs seated in the shade. As soon as we gained a little distance I asked if I could sit at the front of the boat. The permission was given to me and that is where I firmly remained for the rest of the journey, even though the spot had no shade. 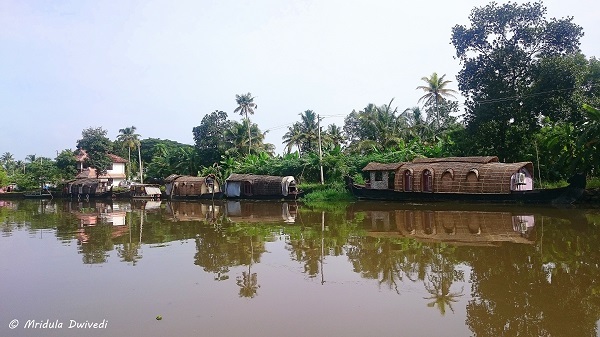 By now I have been in the backwaters in a houseboat, canoe and a kayak (on a previous trip). Each has its own advantages but then that is the topic of a separate post. A canoe can get into narrower water channels than a houseboat but a houseboat offers luxury. 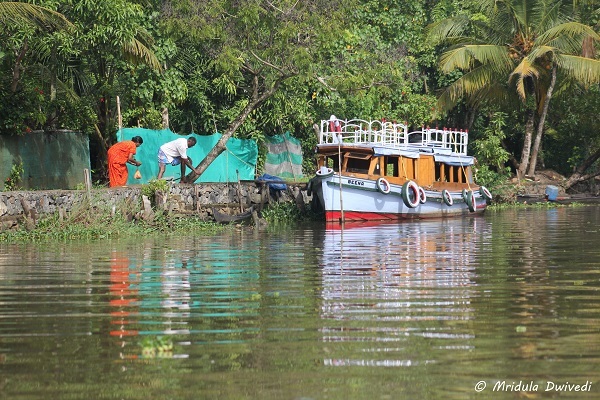 I wonder how the residents of the backwaters feel about the boats of tourists with their cameras? I mean they come to the canal to wash something and their goes a tourist, click! However this bunch of kids had fun and wanted me to click a picture of them splashing about. A canoe can take you closer to the birds. 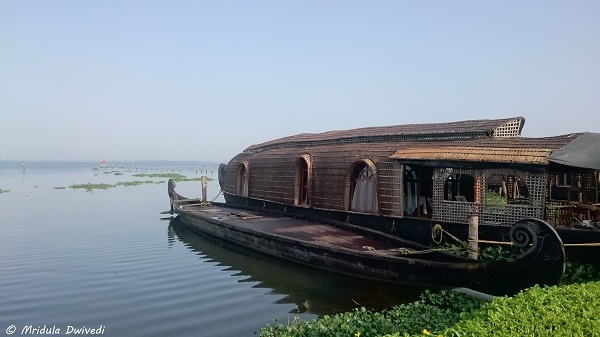 When you take a trip through the backwaters, do expect to see birds up close. The trouble is that the canoe is always moving and it is difficult to get focus right. This was my first sighting of a Darter. 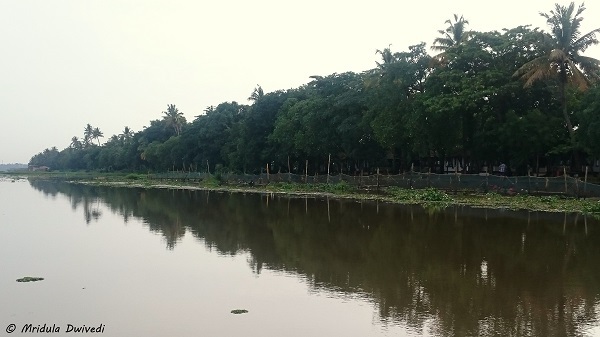 It is looking at the pictures I realized that the Vembanad Lake is a mirror, it doubles the beauty of the Kerala Backwaters! As it was the monsoons, the greenery was even more startling, if that is possible! 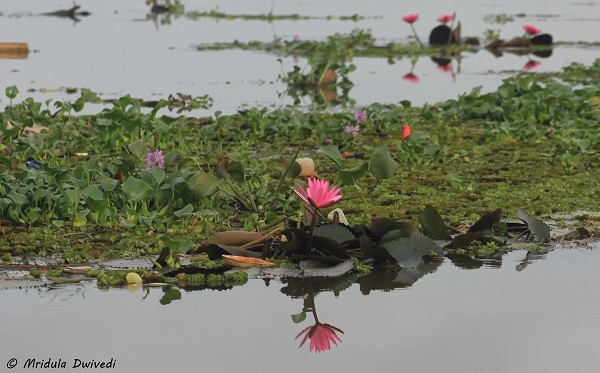 I had visited Alleppey in 2013 but I do not remember seeing so many lotus before. 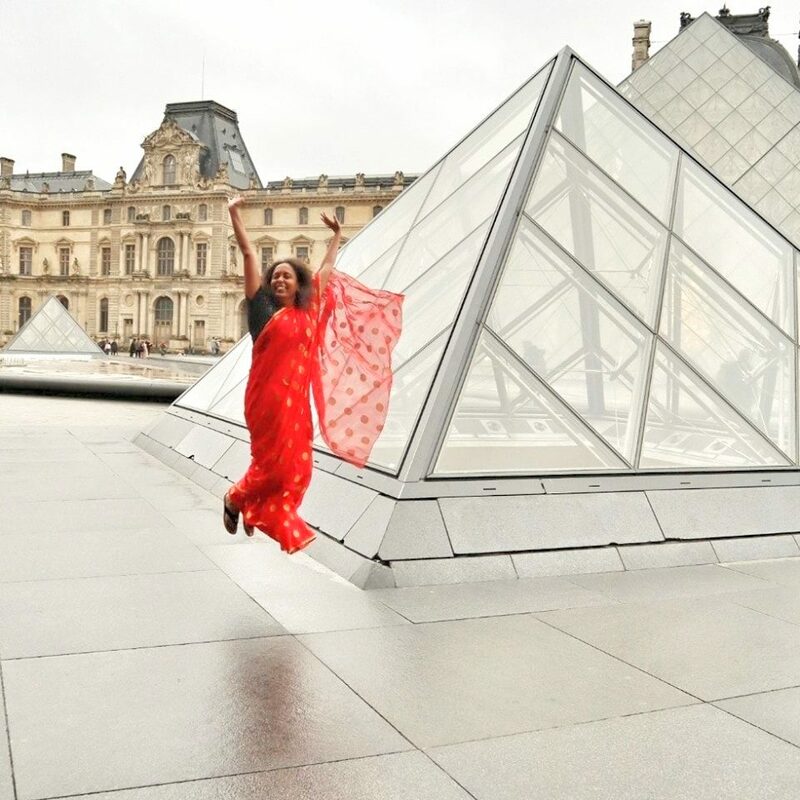 They were such a joy, and the joy was double because of the reflections! 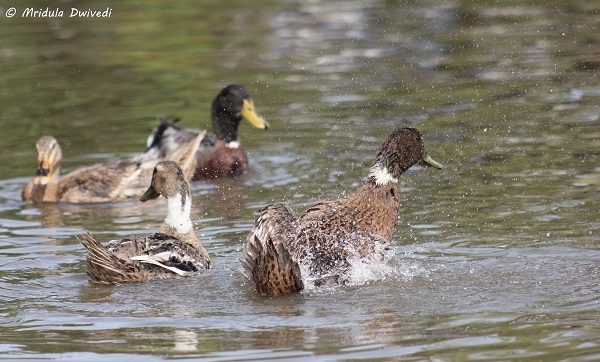 It is more probable on a canoe to catch a duck shaking off water from its body. And if I manage to get a half way decent picture, it is an added bonus. I saw a Kingfisher with a small fish in its beak, but that delight is mine only. The picture is so blurred and bad and I do not dare to share it! 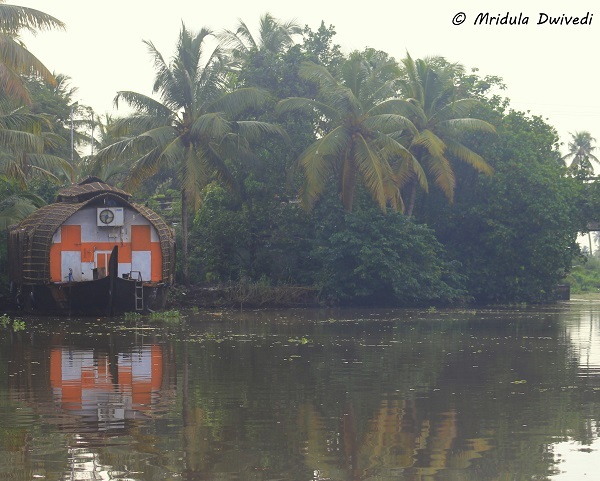 If not a yellow submarine, how about living in a yellow house by the backwaters? I would say it could be the next best thing to the yellow submarine! 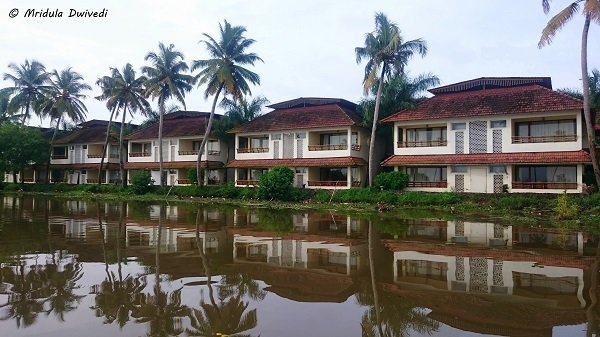 By going around in the lake for a few times, I got the feeling that Kumarakom has many resorts. But even then, they are tucked away in various corners. At no point I got a feeling that the place was overrun with resorts! The most common site on a canoe (or any other) trip are the houseboats. After all there are about 500 in and around Alleppey alone! 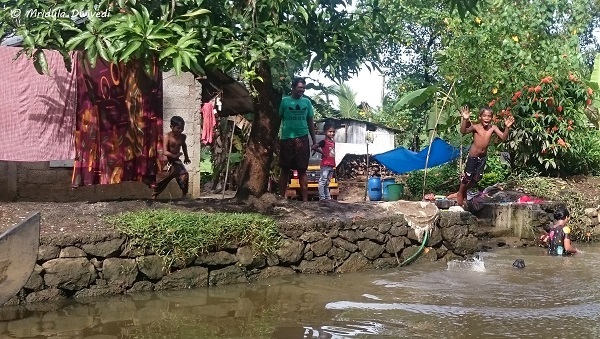 While I am was a short canoe trip, people actually live around the backwaters. They have to do many of their daily chores with tourists gliding around! I had a zoom which I was using for most of my photographs. But I was somehow reluctant to point it out at people. I would exchange a smile with them instead! We took a circular path and I was deposited back in time to have my breakfast at the resort. The good folks had kept refreshments for me in the canoe but I truly didn’t budge from the front of the boat for the while trip! My eyes were glues to the camera and the scenery. The trip was soothing to the eyes. The fresh air did wonders for my appetite.